Our second Colorado Blender User Group meeting is scheduled! 7:30-8:30 Exploring Logic Bricks in the Blender Game Engine (I'll present and walk through some of the basics). Come on over and say "hello" and share your Blender experiences and questions. This episode has two "firsts" for Bits of Blender. Richard has been wanting to do a Bit and ever since trying 2.5, he does not want to go back to 2.49b. 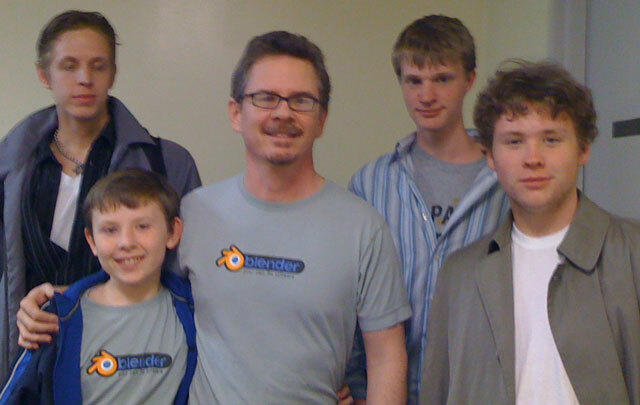 Seems natural that the next generation of Blender is introduced by the next generation! I'm still half in 2.49b and half in 2.5, so I can't guarantee I'll be doing a 2.5 Bit next, it'll have to depend on what I'm teaching. I think 2.5 is great, but it's still alpha software, which means it's feature set is not yet frozen (or even completely implemented) and there are plenty of bugs. All normal stuff for alpha software. If you're new to Blender, don't judge its stablity by 2.5. Blender 2.49b is among my most stable and best-performing applications. When 2.5 moves out of beta, I've no doubt it'll have the same high-level of stability and performance as 2.49b but also with a great new user interface and a host of new features and functionality. Blender Users Exist in Colorado! We had 7 people at our first meeting! From as far away as Colorado Springs, with a wide range of interests, skills and experiences (programming, compositing, animation, and education). Thanks to Clay, Tom, Troy, Duncan, Matt and Richard for showing up and sharing their experience. I'm going to start a Blender users group and have our first meeting this Thursday at 7pm! It will be at the Parker Library in Parker.